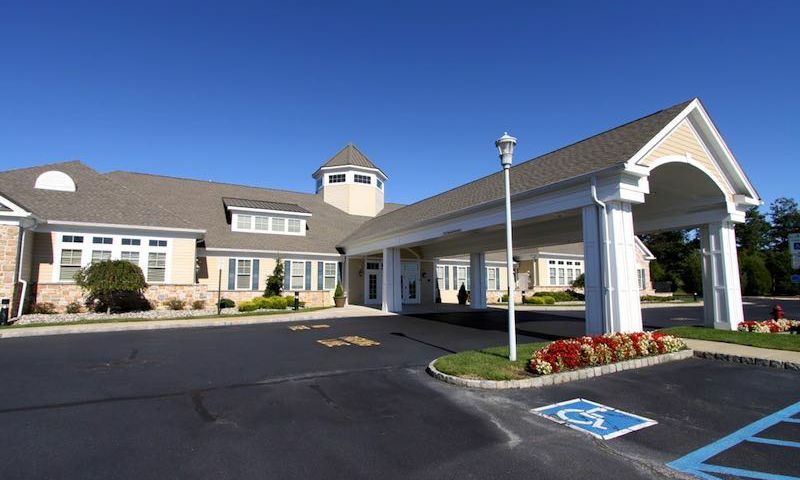 Heritage Point in Barnegat features resort living near the beautiful Jersey Shore in Ocean County, New Jersey. This distinctive community, built by Mignatti, is age-restricted and welcomes residents over the age of 55. The two spacious amenity centers give residents the true experience of the active life that is found in a resort-style community, while the wide variety of social clubs are sure to encourage new friendships among neighbors. Active adults will love exploring the surrounding areas as well, particularly the natural beauty of the Barnegat Bay. The bustling attractions of Atlantic City are only 45 minutes south of Barnegat, and several major cities are just a bit farther. Both New York City and Philadelphia are approximately 90 minutes away, which makes either a great weekend getaway when residents crave a change of pace. Activities are centered on two separate clubhouses: The Point Resort Club and The Breakers Spa Center. The Breakers Spa Center houses an Olympic-length heated indoor swimming pool, hot tub, and men’s and women’s locker rooms and saunas. The spa center also includes fully equipped fitness facilities, with both cardiovascular and strength training equipment, and a dedicated aerobics studio. There is a large multipurpose room, as well as indoor lounges and billiard rooms. Outdoors, residents will find tennis courts, a putting green, a chipping green, and horseshoe pits. The Point Resort Club features many different hobby, game, and meeting rooms. Computer stations are available in the Internet Room and the library is a cozy spot to meet with friends or enjoy a quiet afternoon. The Point Resort Club also includes a craft center, game room, ballroom, lounges, men’s and ladies’ clubrooms, and a catering kitchen. Outdoors, The Point Resort Club offers an outdoor pool, terrace, and a cabana for lounging during the warmer months. Bocce ball courts and a shuffleboard area are also available. Heritage Point’s two and three-bedroom single-family homes are available in 16 different floor plans, all built by Mignatti. Construction began in 2003 and there will be over 921 homes in the community upon completion. These homes range in size from 1,428 to 3,075 square feet and offer two or three bedrooms, two to three-and-a-half bathrooms, and an attached two-car garage. Each new home includes popular features such as great rooms, formal living and dining areas, breakfast nooks, studies, and two-car garages. Homeowners can further customize their homes with options that include lofts, sunrooms, basements, patios, decks, and porches. Desirable interior features include entryways with hardwood flooring, spacious closets, decorative light fixtures, and distinctive raised panel colonial doors. The well-appointed kitchens include GE appliances, granite countertops, and AristoKraft cabinetry with 42-inch upper cabinets. Each home also features a luxurious master bathroom as well as a second full bathroom. In addition to the new construction homes by Mignatti, there are also a variety of pre-owned resale homes available for sale in Heritage Point. Approximately eighty percent of the homes back to open space with spectacular views of the surrounding Barnegat landscape. The low-maintenance exteriors include vinyl siding, fiberglass roof shingles and insulated raised-panel entry doors. Covered entries are available on most home models. Lawn cutting and snow removal services are included in the association fee. Active adults will appreciate the many features at Heritage Point that support a healthy lifestyle, both physically and socially. From the fully equipped fitness center to the variety of outdoor sports courts, residents will have no trouble finding a way to stay in shape. Socially, Heritage Point’s two spectacular clubhouses provide many locations for group meetings or impromptu get-togethers. Social clubs at Heritage Point cover a wide spectrum of interests. Groups meet to play cards, express their creativity through arts and crafts, discuss books, participate in sports, or otherwise share their interests. The many social clubs are a great way for new residents to get to know their neighbors while exploring a new or long-held interest. These include the Italian American Club, holiday parties, and singles club. There is also a full-time activities director to help residents make the most of living in a resort-style community. Breakers Spa is one of two clubhouses that Heritage Point offers. Whether your choice of exercise is a game of tennis with a friend or taking a jog on the treadmill, Breakers Spa can ensure that you stay fit year-round. The Point Resort Club acts as the social and activity center for Heritage Point. You can attend formal dances at the Grand Sea Breeze Ballroom, relax on the cabana with your neighbor, and participate in a bocce ball tournament without leaving the Club. There are plenty of activities available in Heritage Point. Here is a sample of some of the clubs, activities and classes offered here. Mignatti began development of Heritage Point in 2003 and the community will have 921 single-family homes upon completion. These homes range in size from 1,428 to 3,075 square feet and offer two or three bedrooms, two to three-and-a-half bathrooms, and an attached two-car garage. Each new home includes popular features such as great rooms, formal living and dining areas, breakfast nooks, studies and two-car garages. Homeowners can further customize their homes with options that include lofts, sunrooms, basements, patios, decks and porches. Desirable interior features include entryways with hardwood flooring, spacious closets, decorative light fixtures, and distinctive raised panel colonial doors. Very nice clubhouse and great location. I love the easy access to LBI in the summer months! Love the clubhouse. Active with plenty of activities. Convienient to plenty of shopping. Joe and I bought our home here in 2010 and just love it. The clubhouse is so nice and everyone is really friendly. We get a lot of use out of the fitness center and the pool is amazing! We like meeting up with friends at the billiards room before heading out to dinner. It's a really nice set-up here! 55places.com is not affiliated with the developer(s) or homeowners association of Heritage Point. The information you submit is distributed to a 55places.com Partner Agent, who is a licensed real estate agent. The information regarding Heritage Point has not been verified or approved by the developer or homeowners association. Please verify all information prior to purchasing. 55places.com is not responsible for any errors regarding the information displayed on this website.